Nisha Pillai is a news presenter for BBC World television. Prior to this she worked for the BBC's Current Affairs programme Panorama from 1990 to 1995. 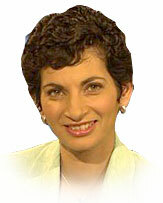 Nisha joined the BBC in November 1986 where she worked on The Money Programme. In 1991 she spent nine months investigating the financial empire of Robert Maxwell and the subsequent programme called The Max Factor won a Royal Television Society Award. Another programme focused on Muslims in Britain, called Underclass in Purdah which predicted social turmoil and violence. After working for Panorama for five years she joined BBC World television in October 1995 as a news presenter. Since joining Nisha has presented live coverage of both Pakistan's and Israel's 50th anniversary of independence. She has previously presented HARDtalk when regular presenter Tim Sebastian is away, and has interviewed amongst others Sir Yehudi Menuhin, V.S. Naipaul and Phil Collins. Nisha was born in Calcutta but spent her childhood in Bombay. She then attended a girls school in the UK, before studying at the London School of Economics.